Muharram is upon us…Inshallah over the next few days I will be sharing collective ideas on how we can make the next 10 days as inspiring and impactful to our children as possible. Please share your comments and ideas as they are invaluable! Just as we decorate our houses for our celebrations, let’s commemorate through this means too. 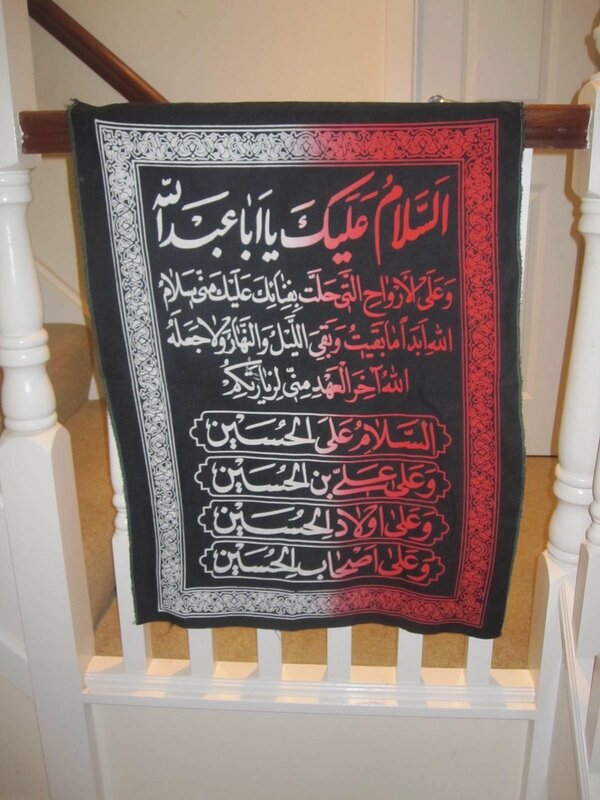 Ever since I can remember, as soon as Muharram was upon us, black cloths were draped around the house, and in particular, over the TV. Nowadays there are little black and green flags available – why not get our kids to put them up around the house in places of their choosing? This is a picture of the front of my house. Every year, we try to make this very small commitment to ensure these symbols of grief grace our home until after Arba’een. This year has been tough. I have really been struggling with a lot of elements in my life and honestly and embarrassingly admit that I was having a tough time ‘connecting’ and getting into ‘the zone’…’Dunya’ has truly ensnared me from all angles 😓. Yesterday, already a few days into the Ashra, the symbols still weren’t up and I had essentially given up and decided to skip the ritual this year. I just didn’t have it in me…after work, after pick ups and drop offs, etc I was thoroughly exhausted, not feeling ‘it’ and was barely even making it to mosque awake; there was just no time or importance for this. As I was driving between work and pick ups and drop offs, my mom called. We chatted for a bit and she asked if I had put up the banners. I embarrassingly said no and told her I was going to skip it this year; it was too late anyways. It struck a chord, so I dutifully went to find all the banners and began cleaning them off and putting them up. It was done…but I still didn’t feel a sense of fulfillment. After all, I wasn’t ‘connected’. That fulfillment came today. I had slept in and missed my morning meeting, so was ‘stuck’ working from home…if I had began driving to work when I got up I would have missed any subsequent conference calls. They day had not even begun and I was already behind the proverbial ‘8 ball’…Great. All I saw in her eyes was focus, faith and determination…I couldn’t understand anything she was saying but yet I knew in my heart exactly what she was saying. It was the language of love, sacrifice, doubtless, unquestionable faith, of wilayah…and it was the most beautiful dialogue between a servant and her Master that I had ever witnessed. I stood there watching her, crying like a child as she moved from the alam, to the turbahs, to the tasbihs, to the banners, touching each item, holding it to her heart, murmuring words of yearning and grief and then doing it all over again…for well over an hour. Here I was, with everything at my disposal, complaining that I couldn’t ‘connect’ and look how Imam guided her, His servant, who had NOTHING, to the connection she was yearning for! This lady was an absolute inspiration and ignitor of ‘connection’. Truly Imam is generous, truly His ways are not understood! This has to have been one of the most humbling and eye opening experiences of my life. We parted ways, both with tears streaming down our faces…united only by the Love for Husayn. We consistently hear, during these nights about the ‘Universality’ of Husayn…how Husayn belongs not only to us but to everyone. I have believed that Husayns’ legacy is such, that he has no need for us to advocate for him. This event has truly proved that for me. It has let me see that his intervention is nothing but divine. His unique connection to Allah swt has already cemented his legacy and how it will be spread in a divine manner…these affairs are truly not ours to manage. Thank you Mom Shamim Haji for persuading me to keep my dying flame alive ❤️.